Life as a creative isn't as glamorous as it seems. I've been a writer producer for television marketing for over 10 years and though it is sometimes a lot of fun. It is hard work. Having to be come up with a brilliant script or tagline for a not so brilliant show or segment at a moments notice isn't the easiest thing to do. Creativity comes in a spark and over the years I've had to train myself to dig deep in order to come up with something, that someone else will deem as usable. But the best times to hone this skill are at times you're not suppose to be thinking about it. On the bus, on a walk, or in the shower. 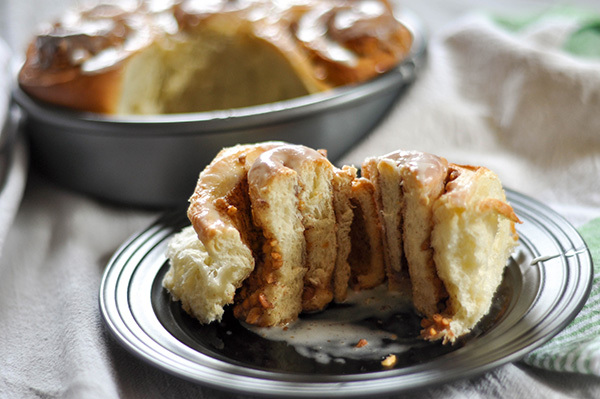 They always say you come up with the best ideas in the shower...and this idea for a Hokkaido Milk bread cinnamon roll was a total winner. The shower is seriously when I do a lot of thinking. As a working mom, its really your only moment of solace. Away from your husband, the kids and life in general. So ask i was thinking of an idea for a new weekend bake, it hit me. Trying to rationalize my cravings for cinnamon and things that my family would actually eat. Hokkaido milk bread is always a winner. We are all, as my daughter would say, carb-a-vores. But I really wanted something with the warmth of cinnamon... why not combine the two? 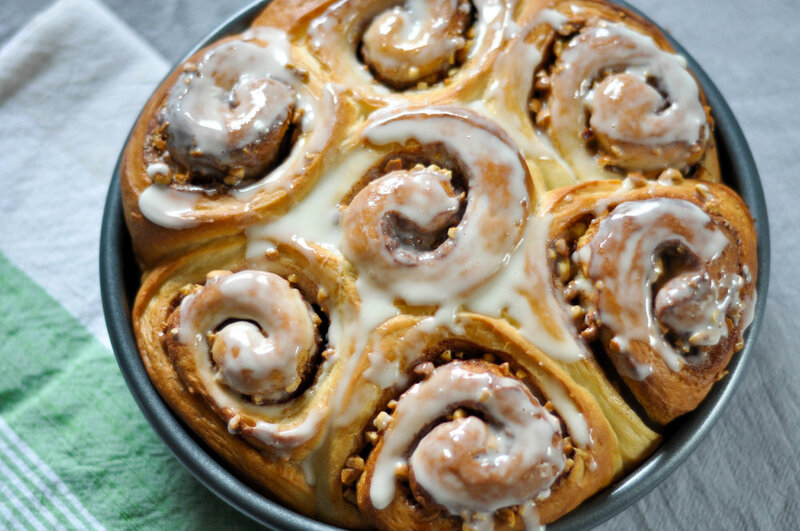 I've always had on and off success making home made cinnamon rolls using traditional bread recipes. But Milk bread I knew very well. This recipe uses the tangzhou method of making milk bread. It uses a cooked roux as a starter which helps to produce a very soft and feathery texture. Milk, bread flour and water are heated slowly till it thickens. This is then added to the dough and mixed in with the flour, yeast and egg. The dough rises for an hour then punched down, divided into two pieces and allowed to rest for 15- 20 minutes. Once rested, I rolled the dough out to a large rectangle. I then spread the softened butter all over and generously sprinkled on the cinnamon sugar and peanut filling. This gets rolled up along the long side of the rectangle. I cut these into 2 inch wide rolls and placed them into a well buttered cake pan. This gets it's second rise, which makes me super happy. Puffy risen dough is one of the ultimate joys of bread baking. It's proof...you've done the right steps. And in life, there aren't a lot of things that give you proof of your success better than bread! This baked up warm, with a texture that was soft and feathery but had a slight chew around the edges. For the interior I used a mix of cinnamon sugar and finely chopped peanuts to make it reminiscent of a Korean Hoetteok filling. And its all held together with a slathering of butter. Can you taste it? 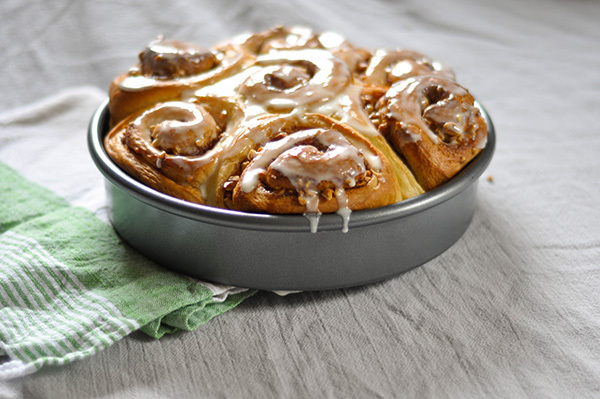 This recipe makes two pans of cinnabon sized rolls, which works out well because these are going to fly. I drizzled it with a glaze made with condensed milk. Oh my. It just doesn't get better than this. If you want to take your milk bread to the next level, this is the way to go. Try this recipe and tag me on instagram with #thesweetandsourbaker! 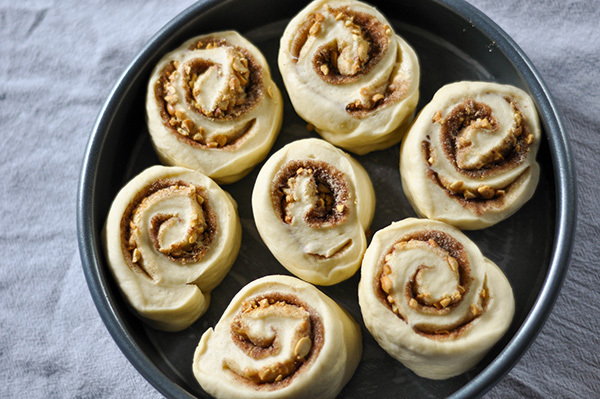 I can't wait to see your pics of cinnamon swirled perfection! in a small bowl, mix the sugar, cinnamon and chopped peanuts together until combined. 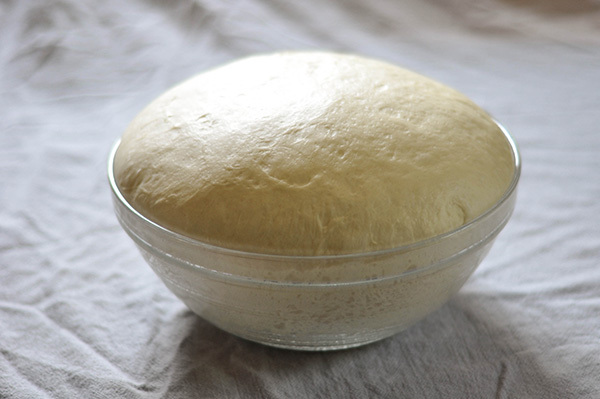 Once the dough has had its first rise. Punch it down to let out the air. Then divide the dough in half. Put one half aside to be shaped later. Roll one half of the dough out to a large rectangle about 16X8"
Spread the 3 tbsp of soft butter all over the dough, making sure to cover as much area as you can. 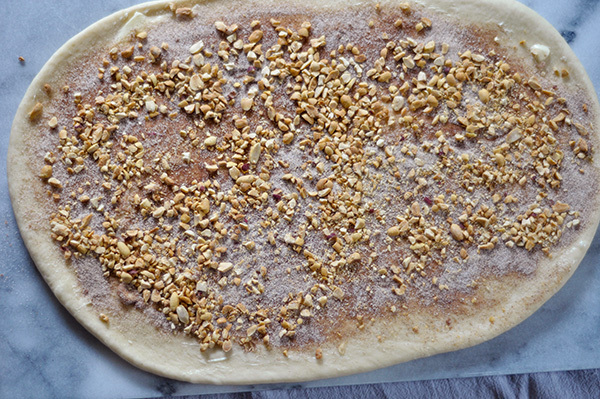 Sprinkle the Cinnamon sugar and peanut mixture all over the top of the buttered dough. Then starting on one side of the long end of the dough, start to roll. 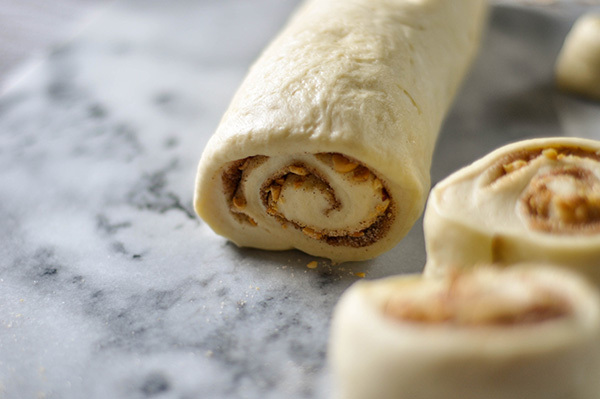 Roll the dough into a log pulling backwards every once in a while to ensure a tight roll. Place the log seam side down and mark off 2 inch segments. Cut the log into rolls. I used a bench scraper to do this, but I've heard that unflavored dental floss also does the trick! Place the rolls in the prepared cake pans face up. Cover and allow to rise in a warm place for an hour, or until puffy and are touch on another. Brush the tops of the rolls with whole milk. Bake for 20-25 minutes. While baking, make the glaze. Whisk the powdered sugar into the condensed milk. Add the milk 1 tablespoon at a time to loosen up the glaze to the desired consistency. While the rolls are still warm, Pour or spread the glaze over the top. Serve warm!